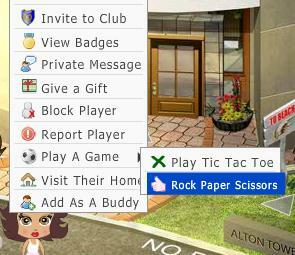 In YoWorld, players can get "coins" by playing Rock Paper Scissors or Tic Tac Toe games with each other. You may find other players through a "Maxing Party". You can access YoWorld Events using the Events icon at the bottom. When you select the Events icon, scroll down to the "Games" category where most players start maxing parties there. The event titles usually contain short forms, because of limits on the number of words. For example, RPS means Rock Paper Scissors and TTT stands for Tic Tac Toe. In a Maxing Party, Rock Paper Scissors is more preferred because it is much faster to win. Once you find a maxing party, select it and confirm to be taken there. In a maxing party, the people who want to obtain coins are known as "Maxees". Usually the room owner and some volunteers (called "Maxers") will help. The room owner may assign different colors of chairs for maxers and maxees. When you arrive at a maxing party, you should sit on a correct chair. If the room is slow to load, wait a few more seconds before sitting. Otherwise you may sit on other people and do not notice it! If you are a maxee, click on a maxer avatar and select "Play A Game". For rock paper scissors games, the maxer will close the game window after the first round. The maxee would win immediately and get 10 coins and 5 YoPoints. There is a maximum of winning 200 coins every 24 hours, after which the maxee is "maxed". 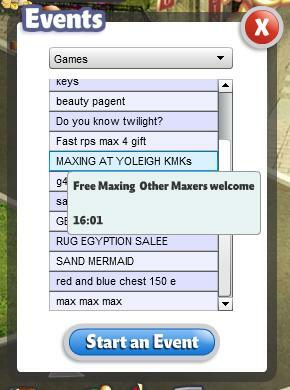 Before leaving a maxing party, maxees would often send a gift to thank the maxers. Max, Maxed, Maxing There is a maximum of winning 200 coins through Rock Paper Scissors or Tic Tac Toe games every 24 hours. When a person is "maxed", he/she needs to wait 24 hours to win more coins. The term "Maxing" refers to the activities of playing games in order to win coins. Max for Max (or Max 4 Max, M4M) Two persons come together and play Rock Paper Scissors or Tic Tac Toe games. Each person wins in turns to get coins quickly. Maxee A person who wants to win coins by playing Rock Paper Scissors or Tic Tac Toe games. A maxee usually selects a maxer and clicks to start a game. Maxer A person who has volunteered to let another person win in Rock Paper Scissors or Tic Tac Toe games. In the Rock Paper Scissors game, a maxer often closes the window in the first round so that the opponent wins immediately. Maxing Party An event where people come together and play Rock Paper Scissors or Tic Tac Toe games. YoWorld Events can be accessed using the Events icon at the bottom. Open This is usually spoken by a maxer in a Maxing Party. The person is ready to accept game invitations. This term's origin may come from OPEN and CLOSED shop signs. The game room is slow and I have trouble clicking. This can be due to large number of animated objects in the room. First you should be seated in a maxing party, which will make your avatar fixed. If the room contains many animated items or decorations (like Treasure Chest, Tesla Ball and Blood Orange Punch), you may switch to another room, or politely suggest the room owner to take away these objects. When I click on a person, the menu closes immediately and I can not select the menu. Visit another room, come back and see if the problem remains. This problem is usually more severe with crowded game rooms. Some players suggest that it only happens in Internet Explorer, you may try to use Firefox and see if it helps. I can not close a Rock Paper Scissors or Tic Tac Toe game window, it is stuck on the screen. You will need to refresh your web browser. The room is "raining coins" and I can not click on anything!